Diving the best destinations in the world often requires adventure-seekers to embark upon long journeys to remote and distant locations. Their reward for travelling off the beaten track? Rare underwater encounters and unspoiled dive sites. In this regard, nowhere can compare to the Galápagos. The nearest land mass to this famous archipelago of volcanic islands is the coast of Ecuador, some 800 kilometres away. Their isolated location in the eastern Pacific is also a meeting point for three different bodies of water. Over thousands of years, the Cromwell, Humbolt and Panama currents and their prevailing winds delivered an incredible diversity of life to the islands of the Galápagos, and it is this abundance of animals both on land and underwater that makes the diving here so special. Nutrient rich upwellings from Antarctica meet warmer water from the north, resulting in the only place in the world where tropical fish can be seen alongside temperate water species. Many of these inhabitants are residents that can be encountered year round, including a variety of endemic animals that are a huge draw for wildlife enthusiasts and photographers. Scuba divers get to see the best of both worlds by combining land tours with underwater activities. While it is possible to dive in the Galápagos while being land based the only way to experience the best sites is to join a liveaboard. These trips depart from San Cristobal, the busiest and most populated of the islands; simply arriving at the airport makes one feel they have just stepped straight into an episode of Planet Earth. Huge images of marine life cover every wall and after a short bus ride to the nearby marina visitors are greeted by a large group of rather noisy and smelly sea lions. Most liveaboard itineraries begin in the southern island chain in the waters surrounding Fernandina and Isabela. The water temperature can be a surprise to people used to diving in the tropics, yet it allows encounters with a variety of marine animals that they will not find anywhere else. 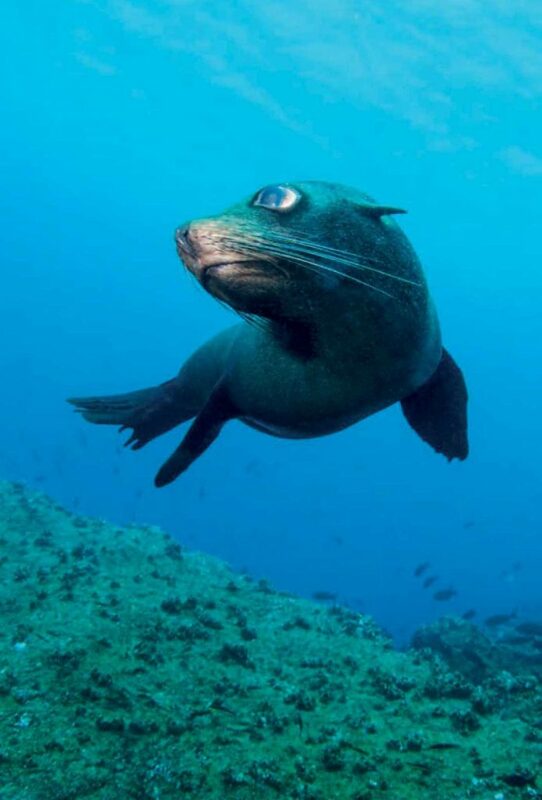 Sea lions that move so sluggishly on land suddenly become impossible to keep up with underwater, frustrating underwater photographers while delighting other divers. 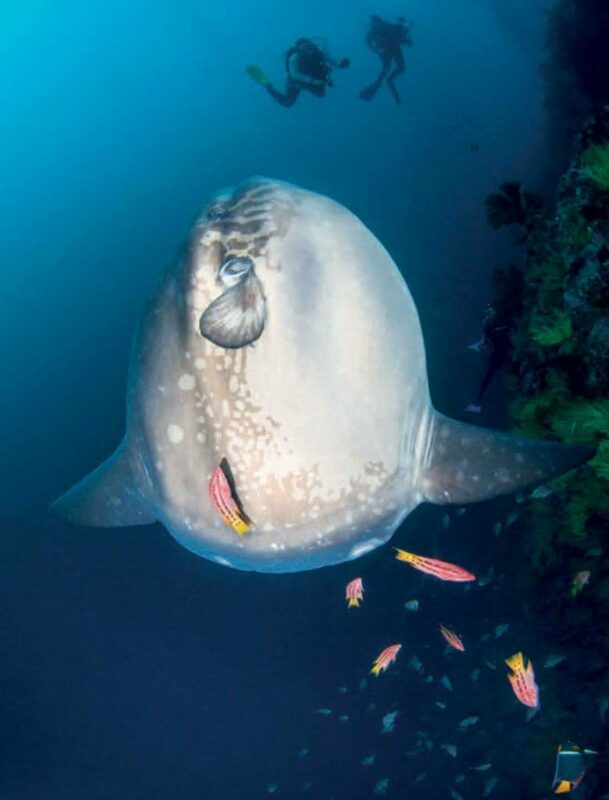 Those willing to go deep and brave the chilling thermoclines at Punta Vincent Roca stand a good chance of coming face to face with huge Mola molas. It’s not just the big stuff either. Frogfish, seahorses and batfish can all be found on the reefs if you can take your eyes off the blue and go into macro mode. What makes this place really special though are two native species not found anywhere else on the planet. The Galápagos penguin is the only one of its kind that lives north of the equator and is able to survive only where the water is coldest. It is strange to see an animal normally associated with ice and snow standing around in the sun and lucky divers may even encounter one underwater as they take a dip to cool down. 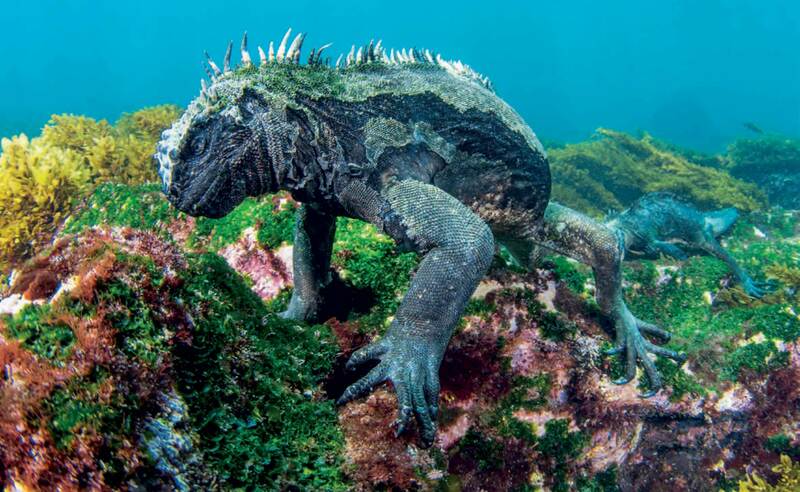 Even more impressive is the marine iguana. Volcanic islands cannot normally sustain large populations of reptiles but evolution had other plans here and these lizards have learnt to dive for food. Nothing can really prepare you for swimming among these creatures as they hold their breath, dive down and munch on clumps of algae. As if this multitude of life was not enough, the real reason most divers come to the Galápagos is to encounter other travellers, migratory pelagic species such as turtles, whales and sharks. These visitors are found further north at the iconic dive sites of Darwin and Wolf. The water is warmer here and at the right time of year it is possible to see huge groups of hammerheads and other sharks. Schools of jacks, barracudas, snappers and other fish provide a reliable food source that sustains these populations. Manta and mobula rays are common too and recently pods of orcas have been spotted actively hunting in the area. Scalloped hammerheads are present year round but numbers vary. These sharks migrate long distances and individuals tagged in the Galápagos have been recorded as far away as Cocos Island in Costa Rica. This data supports the theory that a shark corridor exists, linking oceanic seamounts in the eastern Pacific; an important consideration in the future protection of the species. 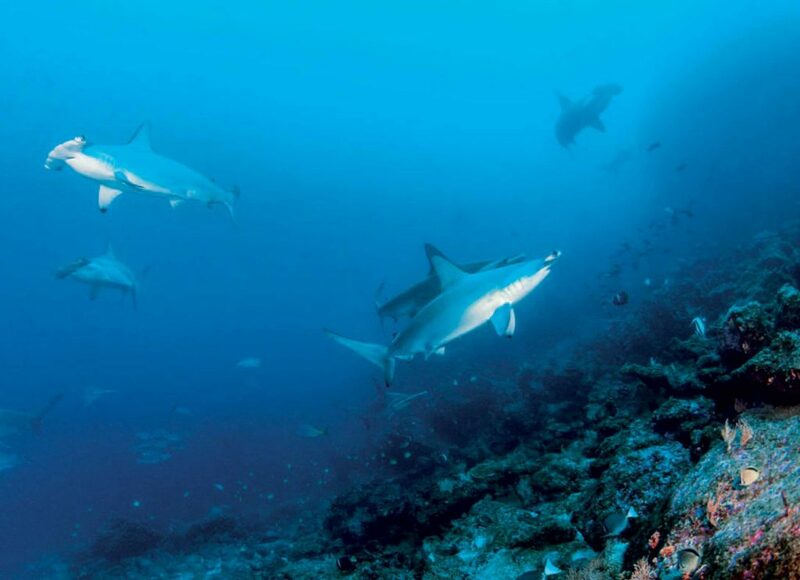 Watching any number of hammerheads swim by is an impressive sight but anyone hoping to see numbers in the hundreds should try and visit between June and November. Read the rest of this article in No.88 Issue 7/2016 of Scuba Diver magazine by subscribing here or check out all of our publications here.